Urban inspired, city design piece has been hand applied with a gel coat finish to give a texturized canvas look. Colours and design of imagery are based around today's popular home dicor colour pallets to create a focal point in your space. In Charisma II, Joyce Combs explores a sudden fascination with visual arts that only began after her family was raised. Joyce uses collage, enamels, oil washes and other techniques to produce the weathered painting surfaces in her work. She stains, hand rubs, waxes, scrapes and varnishes her work to develop the unique richness of colour and texture. The Builders Grey Vanity Mirror is streamlined and versatile and makes perfect for refreshing your living space. It's sleek and simple design will add a finishing touch to a bathroom, living room, entry way or office space. This exquisite beveled mirror is framed with a glorious 4 inch wide flat shell motif frame profile. The satin black finish highlights the surface texture of this unique design. This Manhattan Mirror will be a conversation piece in any room decor. It is a perfect solution for the discerning designer in you. This exquisite beveled mirror is framed with a glorious 4 inch wide crystallized bead design frame profile. The silver finish highlights the surface texture of this unique design. This Cosmopolitan Mirror will be a conversation piece in any room decor. It is a perfect solution for the discerning designer in you. 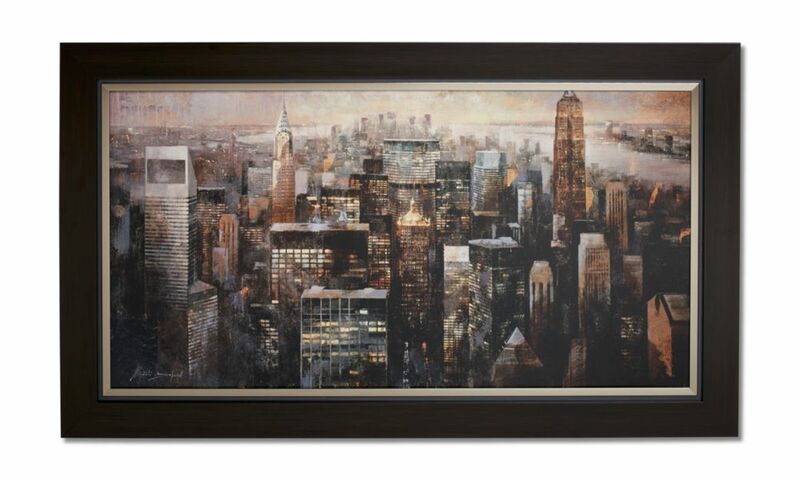 Manhattan By Night Urban inspired, city design piece has been hand applied with a gel coat finish to give a texturized canvas look. Colours and design of imagery are based around today's popular home dicor colour pallets to create a focal point in your space.